Resolutions to Results IX: Commit! The last step in this amazing process is committing to achieving this goal with your whole heart and soul. What does that mean? It means making your goal a priority in your life. Spending a little time every day (or a lot of time on a few days) working -- possibly struggling -- towards this goal. It means keeping at it after others have quit. Sticking to it in bad moods and good moods. 1. Am I willing to pay the price it will cost to get this goal? 2. Am I willing to stick with this until I get it? 3. Is this goal humanly possible? As you review the work you've done, look at the things you stand to gain and lose from this achievement and decide whether or not this is something you are committed to doing, willy nilly, from this second in time forward. Once you commit to pursuing this goal, there will be no going back to the way things were before. You can always re-evaluate and reprioritize your goals, but going back to things the way they were before this work is just not an option. When you're ready to commit to this goal, take a deep breath, and declare outloud, "I am committed to [insert your goal here]." And you're off and running! Now that you've got a Simple, Measurable, Active, Realistic, Timely, and Thrilling goal with due dates assigned, you've got to get going! However, trying to do it alone can be incredibly difficult. Finding mentors and accountability partners will increase your success rate dramatically. But who do you ask? Your mom? Your husband? Maybe, maybe not. Look at your list of roles and responsibilities from the first post: which relationships on that list would benefit most from you achieving your goal? Who in your life is already achieving your goal at the level at which you’d like to achieve it? I really recommend accountability partnerships for achieving goals. While it’s tempting to ask those closest to you to be your accountability partners, that could be a trap. Whether we like it or not, there are rules in the relationships we’ve already established. If you’re the fat sister, using your (skinny) sister as your accountability partner for losing weight might backfire. Instead, setting up a clearly negotiated partnership with someone you don't know quite as well could serve your goal better. With those people, you can explicitly design your relationship and your interactions. You can agree “I will email you about my successes three times a week and no more.” A friend might be confused by this, or feel used, but an accountability partner will reap the same benefits by sharing with you in a similar fashion. Take a few minutes to identify people in your life who can serve you as accountability partners, and then start asking around! Announcing your goal to others is important, too, and has lots of benefits – it forces you to verbally clarify what it is you want, and allows your ears to hear your mouth committing to a goal. It puts your quest more on display, and can give you more positive feedback from the people around you who hear about it. Why haven’t you achieved this in the past? What other goals have you attempted and quit? Do you want to approach this one the same way? If not, what will it take from you to do things differently this time? There are lots of things to be afraid of, but change isn't necessarily one of them. Are you worried that you'll have to work more, sleep less, sweat more? Are you afraid you'll have to give up your security blanket -- whatever that means to you? Be honest with yourself about what scares you so you are better equipped to face that fear instead of waiting to be sideswiped by it. And nobody's judging you on what scares you. This is between you and you, so be real. What will change in your life if you succeed at this goal? This question addresses both the WIIFM (which we talked about earlier) and the OGTSC (the Oh God, That's Scary Crap*) that is likely to come up as you make change. Really look into your future and see the stuff you WANT to change -- what else is likely to change as a side-effect? What can I do to prepare myself for this? Only you really know the answer for this. I know that I am challenged by feeling lonely late at night, and one of the things I do to compensate is to eat. So if my goal is to lose weight, I know I'm going to have to make a plan to handle the feelings of loneliness so that I don't throw myself off target by eating late at night. To address this, I could challenge myself to read 50 pages every night (which would be hard to do while foraging for snacks in the kitchen) or make a plan to call a different friend each weeknight to catch up. Your preparation will be different, but you'll know what to do! Who doesn’t want you to change? Keep Anticipating Obstacles. Today you’re predicting what you think will get in the way, but as you make new progress, unforeseen obstacles can crop up. As you see them, write them down. Often just being aware of what’s in your way can help you to find creative ways around it. Look at both external and internal obstacles. Who are the people in your way? What are the circumstances blocking you? Do you have the tools you need to get the job done? What are the limiting beliefs you have that keep you from achieving your goal? Writing down obstacles takes them out of your head and puts them on paper, where it’s easier to be more objective about them. What are the payoffs? What do you get by not reaching your goal? If you succeed, will you have to give up the fuzzy coziness your comfort zone? Will you have to work harder than you do now? Will you have to give up the image you have of yourself as a victim, and, as a result, give up the attention and sympathy that others give you? It’s human nature to want to stay “safe,” especially if it’s comfortable and secure. Forgive yourself for having been willing to hold onto the obstacles, and then let them go. Embrace change and be courageous! Identify the moment it goes awry. If you have been diligently working towards your goal and then “slip,” identify the moment your thoughts turned from striving to settling. What specific thoughts did you think that allowed you to eat the sweets, spend the money, skip the audition? Have patience and gentleness with yourself on this one – this process takes time and energy, and often requires making more mistakes than you’d prefer. The benefit is that every “mistake” is a learning opportunity. There is no failure – only a chance to learn more and grow more. Use traditionally “creative” techniques to open up your mind. Drawing, painting, sculpting, singing, writing… they can all contribute to deepening the vision you have of your goal. You can also use them to overcome obstacles – draw the things that are in your way, the things that you are afraid of, the people who aren’t helping, and then rip them up! * not exactly a technical term, but close. Now that we know where we’re aiming, let’s map out how we’re going to get there. On a piece of paper, draw a box, and insert the Simple, Measurable, Active, Realistic, Timely, and Thrilling goal you generated in the last post. Underneath that box, write out a list of things that would be POSSIBLE to do to achieve that goal. As you write these things, remember that you're not creating a To Do list, you're simply generating a bunch of ideas. What can I change in my life? What can I do more/less of? What skills or tools can I acquire? When will I spend time on this? What other area in my life can I use to help me? Where can I learn more about how to achieve my goal? With your list of possible tasks in front of you, go ahead and add numbers to them in the order that you would like to tackle them. (You'll notice this was already done in the example.) Be sure that they build on one another. For example, if one of your tasks is to run a mile, and another is to run in a 5k race, you’ll want to accomplish running a mile before running a 5k. Then, once your list is in order, start by breaking down the first task into several actions. This process should repeat and repeat until you feel like you have a variety of actions that are of a manageable size. To demonstrate this, the example (above) is continued below. This person's goal is to get a new job. 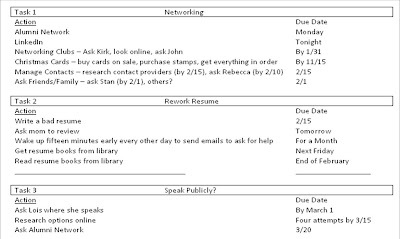 The possible tasks are listed underneath the goal, and "Network" was designated task number 1, "Rework Resume" task number 2, and "Speak Publicly?" task number 3. You'll notice that some of the tasks are broad, brush-stroke kind of tasks, like "LinkedIn" or "Alumni Network," and some of them are more specific, like "Networking Clubs – Ask Kirk, look online, ask John." If you trust yourself to follow through on a bigger, slightly vaguer action, then you can leave that action unexpanded. But if you have any doubt about your willingness or ability to get something like that done, expand it. So what do you do if you have an action you want to perform but don’t know how to do it? Break that task down into “Ask for Help” and then expand that into a list of people you can contact for help! You'll notice on the example, too, that dates have been added. In adding these due dates, you'll want to keep Being Realistic in mind. Can you really write 500 pages by the end of the month? Can you commit to attending 5 networking events a week? Be gentle enough with yourself to avoid burnout, but challenging enough so that the effort of reaching your goal changes your day-to-day energy. Each task and action should have a deadline for it. That said, the deadline can be “by next Friday,” “by March 1st,” or “by the end of the year.” As those deadlines approach, you’ll revisit the list of tasks and subtasks and update the deadlines. You may notice that as you’re adding tasks and due dates that lots of emotions come up for you. Resistance, anger, fear, frustration, or just general discomfort. That’s because you’re making change. Achieving this goal is something you’ve wanted for some time, or you wouldn’t be going after it now. Just know that your challenge to the status quo is going to bring up some of these feelings. These feelings are part of what we’ll be working on in the next post, so be sure to come back! Resolutions to Results V: Get SMARTY! So now that you've brainstormed some great ideas, you've prioritized those ideas, identified success, and visualized yourself achieving those goals, it’s time to get writing! Writing out your goals makes it much more likely to achieve them. How much more likely? 900% (No, I'm kidding I made that up. I actually have no idea.) But from my personal experience, I can say that writing your goals down make them more real, more concrete, and therefore, more achievable. You've probably seen the goal-setting acronym "SMART" before. Lots of different people use these letters to mean lots of different things, and I think that, in general, any way you combine them they're right. The jist of all of them are the same. However, I take SMART one step further, and encourage you to set goals for a SMARTY(pants), because it incorporates an element of goal setting that is missing from a lot of other approaches; the YES! factor. Read on, dear reader, read on. Your brain wants to remember as little as possible. Focus on the heart of what you want, and write it in the positive (not the negative -- like I'm doing here). For example, if you want to stop biting your nails, phrase your goal as “I want to protect my nails from harm” or “I want to take care of my nails.” The reason I recommend this is that if you phrase a goal with a negative in it (quit smoking, stop overeating, stop dating losers), your brain remembers the positive – the smoking, the overeating, the dating losers. So give your brain a healthy, positive, SIMPLE thing on which to focus. As we discussed in previous posts, if you can’t measure your success, you won’t know when you’ve achieved it. Avoid words like “more” and “better,” and instead focus on how much more? How much better? A popular goal is to “get in shape.” What does that even mean? Walking a mile or running a marathon? Be specific! Giving yourself benchmarks to measure your progress will not only help you stay motivated, but it will make your goal setting more scientific and less ambiguous. And ambiguous goals = kinda, sorta, maybe reachable ones. As good writers, actors, teachers, and others know, employing action verbs is critical. The same is true for writing goals. Using action verbs helps you create a goal that has movement behind it. So instead of setting a goal that is to “be more patient,” you can set one to “practice more patience.” It’s a subtle difference, but in those challenging moments, when you’re having a hard time sticking to your goals, having an action that you can perform (like “practice” instead of “be”) will help keep you on your path. It may also open up other possibilities you haven’t considered. For example, if your goal is to “be in more shows,” if you rewrite it to “perform seven times this year,” that opens up the definition of “perform” and can help you see your goal in a new light. If you have trouble coming up with action verbs, look here, here, or just google "action verbs." "Realisitic" is not a synonym for "easy." Realistic, in this case, means actually doable, or attainable. You have the skills needed to do the work – or can develop them in the process. A realistic goal may push your abilities and knowledge, but it shouldn't break them. A goal of never again eating sweets may not be realistic for someone who really enjoys candy. However, setting a goal of eating a piece of fruit each day instead of one chocolate is more realistic. You can then choose to work towards reducing the amount of candy gradually as and when this feels realistic for you. Be sure to set goals that you can attain with some effort! Too difficult and you set the stage for the dreaded "failure," but too low sends your spirit the message that you aren't very capable. Set the bar high enough for a satisfying achievement! As we discussed while we were identifying success, set a timeframe for the goal: for next week, in three months, by your fortieth birthday. Putting an end point on your goal gives you a clear target to work towards, and helps you to break down the goal into chunks you can tackle one week, one month, and one year at a time. If you don't set a deadline, the commitment is too vague and there's hardly any reason to start taking action now. Also, be sure to give yourself enough time to reach the goal, but not so much time that you lose interest or motivation. This is an element that is often left out of goal setting, and which is why you come to me! Be sure to pick a goal that excites, moves, and thrills you! I’ve said it before and I’ll say it again – if what you are trying to achieve is meant to please someone other than yourself, that goal is destined for failure. Find with WIIFM in the goal! And phrase it in such a way that it resonates with you and serves your values. Once you've come up with some goal statements, be brave -- add them to my comments! It will be one way to announce your commitment, and to share what you've learned with other readers! So this speaks pretty powerfully to the value of visualization. Go back to the previous post and take a few minutes to look over the answers you wrote to the questions about what the benefits are for you in achieving your goal. And one by one, try those benefits on, like items from your closet. See how they fit. And if you happen to hear a little voice inside your head saying things like "you can't have that" or "don't be ridiculous," thank that little voice, and tell it to sit on a peg. Remind yourself, as you put on these benefits, that this is just an exercise. It's just practice, to see if these things feel good enough to motivate you to achieve your goal. And when you've got all these winning elements in place, look at yourself in the mirror, a proud doer of what it is you want to do. Can you see yourself in a place of success? Grab a piece of paper and make some notes about this. What does it feel like to achieve your goals? Use juicy details – look, listen, taste, and smell what it will be like to reach your goals. Bring colors, sounds, music, flavors, and textures into your vision. But most importantly, feel it! Create a vision that makes you feel motivated, passionate and enthusiastic, and then revisit that as many times a day as you can. How long should you spend visualizing your own success? As long as you want to. I recognize that we're all busy people, so I suggest starting with thirty seconds to a minute. Do it just after you've parked your car, or for the first 30 seconds on the subway train. Do it while you climb the stairs to your bedroom, or as you pee. Attach your visualization to something you do every day -- that way you'll remember to do it every day! In the few minutes right before you go to sleep or right before you get out of bed your brain is more receptive to the messages you send it. So why not take half a minute while laying in that comfortable position… warm and cozy… to think about what you want? See yourself getting it. And look, if it doesn't get you to your goal, it will make waking less of a drag! I have a coworker who is overweight. And he's lost over 150 pounds already, just by changing his diet (not even exercising). And part of what keeps him motivated is that when he looks in the mirror, he sees himself "looking buff." He imagines himself in a swimsuit, on the beach, with his kids proud to be around such a good looking guy. And EVERY time he looks at himself in a full body mirror, he does this. So try it. Commit to it for a week and just see what happens. If it doesn't work for you, then at least you can cross it off your list of things to try having given it your best shot. * See Karate of Okinawa: Building Warrior Spirit with Gan*Soku*Tanden*Riki by Robert Scaglione and William Cummins for more details. In the previous post, we discussed two tools to help you identify success and point yourself towards it -- Measurability and WIIFM (What's In It For Me?) In this post, we'll take a look at two other tools that will help you see what the successful achievement of your goal looks like. It’s crucial that your goals be in alignment with your values – the ideas and principles you hold near and dear to your heart. If your goals are not in alignment with your values, it will be harder to achieve them -- because achieving them may make you feel good, but it won’t thrill you in the same way as achieving something you value. There are a number of ways to identify your values – and each could be a post of its own. I’ll cover these pretty quickly, but values are great things to on your own. One way to identify your values is to simply think of the ideas and principles that are important to you. What do you value in your life? For me, things like "being real," "taking care of myself," and "growth" are hugely important. Make a list of the things that make up your backbone and keep you walking through life with pride. And if a value seems obvious to you, that's ok -- sometimes the obvious things are what keep us ticking. Another way to identify your values is to think of the times in your life when you were most fulfilled – and then to look at what was underlying that fulfillment. For example, I remember being extremely happy with my mother recently. She was visiting, and I was doing a puppet show for her. The interaction touched on three values that are extremely important to me – family, laughter, and silliness. A third way to identify values is to think of something that really pisses you off – rude people on the subway, litterbugs, etc. – and look at what it is inside of you that feels violated when you encounter those things. If your answer is "it's just not right" or "it's rude," dig a little deeper and see what's not right, and what's rude, and why those things matter to you. Knowing which values you’re honoring by achieving the goal will also help you to identify which values you’re stepping on by NOT achieving the goal. And choosing to live in alignment with your values can be hugely freeing! This is a loaded phrase. To some people it means “just barely getting by.” For others, it’s the unattainable goal, the feeling that you, yourself, are good enough. What I’d like this phrase to mean in this context is much more technical – “how much effort do I need to expend to feel I’ve achieved this goal?” What, in terms of achieving your goal, counts? Try not to think of this as just scraping by, or doing the bare minimum, but rather, setting the finish line for yourself to cross, after which point everything else is gravy. This is where numbers can come in handy. Is 10 pounds good enough, or do you really need to lose 15 to feel successful? Is eating one extra vegetable a day good enough, or do you want to add in 15 servings a week to feel you're eating healthier? When you add Measurability to a goal, combine it with the benefits of WIIFM, figure out which values are being served (and which are being stepped on without achieving this goal), and identify the finish line for yourself, you're prepared for success -- because you know what it is! In the next post, we'll look at Visualizing Success, another important aspect of reaching your goals! And don't forget -- spread the word! Blog readers can sign up for the Make It Happen Now! workshop at the discounted union price. Just contact me and let me know you saw it here! This is part three in an ongoing series of posts about setting (and reaching!) your goals this year. Part I (Brainstorming Goals) is here, and Part II (Prioritizing) is here. This post picks up where those two leave off. Identifying the successful achievement of your goal is really important. If you don't know where you're going, how will you know when you've gotten there? In the course of the next two posts, I'll share with you some tools to use to identify a successful achievement of your goal. To identify success, your mind actually needs some numbers. If your goal is “to work more” this year, what does “more” mean? Is one show or published article enough? Or do you have to do six shows this year, or four published articles for it to count as “more”? Similarly, if you want to lose weight, how much do you want to lose? “Some?” Or fifteen pounds? When you’ve lost a pound, are you halfway there, or are you one tenth of the way? It’s hard to stay motivated when the desired end results are vague. It’s also really easy to let yourself off the hook when you use “mushy” words to identify success. Coming up with numbers helps you distribute the work that you’ll have to do over the course of a year. If you want to teach six classes this year, that’s one every other month, on average. If you’re not sure how you want to define success, try picking something. Make it realistic -- not losing 100 pounds by Valentine’s day, or getting your demo produced tomorrow. But if you’re not sure what’s realistic, ask your friends and family. Ask someone else who's done what you're hoping to achieve. Or just pick something. If you don’t get there this year, then adjust for next year. If you get there too quickly this year, you can always add to your goal. 2. WIIFM -- What's In It For Me? Answering these questions specifically and richly will help you to stay on target. For big challenges, you can post the answers to the WIIFM questions in areas of high visibility (the fridge, your screensaver, over the toilet). Remembering what you’ll gain from the achievement will help you in the moment-to-moment choice-making. Join me in the next post for two more tools to help you identify success and point yourself more specifically in that direction. And don't forget! There's still time to sign up for the Make It Happen Now! workshop that I'm offering on January 16th from 2-5 pm. Information and the sign up button can be found here. Something to remember about the brainstorming you've already done -- don’t limit yourself to what’s realistic. Focus on what’s thrilling and exciting. If you get too bogged down in what's "likely" or "doable," you won't stretch yourself to what's possible. How can you tell the difference? If you have any goals that will keep you alive, or provide you food or shelter, they should be given priority over others. The rest? You’ll have to decide on those with your gut. What makes you feel anxiety, the removal of which would free up your energy to do other things? Which goals thrill and excite you, and which make you feel obligated? Which of the goals feel like a stretch, which feel like a risk, and which feel like you’ll die if you do them? And how much do you want to push yourself this year? Any goals that will push you forward are good goals, in my mind. Some of you may be better motivated by fear, and eliminating something you're afraid of will be a good goal for you. Some of you may be better motivated by rewards, and so pursuing something thrilling will be good for you. The only thing I recommend is that the goal move you in some way. Going for the same old thing you went for (and didn't likely achieve) last year will lead to more boredom, monotony, and quitting. Pick something that gives you a first-date-quiver. Or a public-speaking butterfly. Once you've got one top goal (you can come back and pick little sub-goals after we're done), we'll move on to the next step, Identifying Success. Don't forget! There's still time to sign up for my Goal Setting class on January 16th, where we'll put all these tools into action. More information is available in the upper left hand corner of the screen! Go from Resolutions to Results! Happy New Year! May this be the year everything changes for the better! Goals are an important way to get where you're going. They can help motivate you to live your dreams (instead of sitting on the couch, dreaming them), and they can provide you with invaluable insight about yourself and what's in your way. I'll be writing a number of posts about goal setting, and using the momentum from the beginning of the year to make some real changes in your life. These are all in alignment with the workshop I'm teaching on the 16th of January on goal setting (and goal reaching!) so if you enjoy the posts, feel free to share them with others, and sign up for the course! The first step in goal setting is identifying what you want more of in your life. And a good way to do that is through brainstorming. If you've already got a goal in mind for 2010, you can still use the tools below to deepen and specify that goal, and you might find that they'll give you an additional idea or two. Brainstorming is where you just look at your life with curiosity and fascination. You don't have to know how to reach the goals that speak to you in this exercise, you just have to feel what thinking about these goals does to your body. Do you feel more alive? Tense? Angry? Excited? Just see what comes up as you work with the tools below. Then, take a moment and assess your level of satisfaction with each area in your life. This isn’t about how much money you have or how many friends you have. It’s about how happy you are with the money or friends you already have. When I look at my life and think about the variety of things I do, I sometimes wonder how I get it all done, and I imagine the same is true for you. Part of the reason I manage to get it all done is because I don’t have to do all of it every single day. It’s as if I have a variety of jobs, but I only have to go to specific jobs each day. I’m responsible for all of the jobs, but some days different jobs take precedence. Take a moment to examine your life and the wide variety of things you do. You’re a child, a parent, a lover, a friend, a co-worker, a Buddhist, a gym bunny, a tap dancer, a novelist. As you write down each job, underneath it, write out the responsibilities you have that go with that job. “Call Mom on Sundays, eat more spinach, submit samples to recruiters, write your blog” whatever. Where is there room for improvement or opportunity for growth? When you see it, circle that responsibility. It could turn out to be a goal! While this is a less positive place to look for goals, it is valuable nonetheless. What do you want (or want more of) in your life? What feels like it’s missing? Where are you least powerful? Where are your biggest opportunities for growth? You can uncover these in both the Wheel of Life and the Roles and Responsibilities, but may also already know the answer in your heart. Take a moment to just breathe, ask yourself the question "what do I want more of?" and listen for the answer. As you do this, be sure that what you claim you want is really coming from YOU, and not from some outside source, influencing who you think you SHOULD be. Make sure these are your wants, not your mother’s, not your boss’, not your roommate’s. Now you have in front of you a list of possible opportunities for setting a goal. The next step is prioritizing, and we'll cover that in the next post!